Velocity and Power Targets in Workout Designs – Coaches can now specify velocity and power targets for trackable Exercises prescribed in workout designs. The Velocity column is renamed to Target, providing a place where coaches can specify a target value for Average Velocity, Peak Velocity, Average Power, or Peak Power. 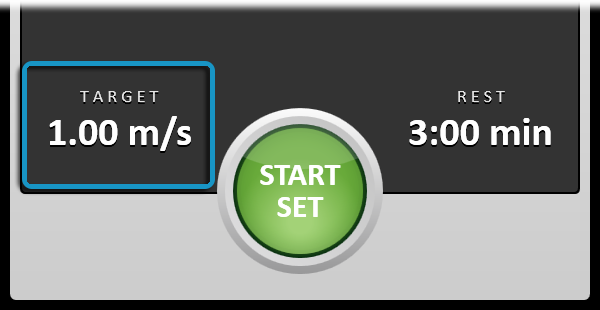 Targets also serve as default values initially displayed on PowerTracker screens. Athletes can still change between Velocity/Power and Average/Peak at the rack but cannot alter the Target prescriptions of the Workout. Coaches can specify a minimum amount of power (watts) or velocity (meters/second) as the Target value so an Athlete is made aware of the prescribed goals on the PowerTracker screen. For example, a coach can design a Workout that requires Athletes to achieve 1.0 m/s Peak Velocity for all of the Squat Reps they perform during the current Set by selecting “PV – Peak Velocity” from the drop-down and entering “1.0”. Coaches can also assign a percentage of power or velocity as a Target. For example, a coach can design a Workout that requires Athletes to achieve 60% of their Peak Power from all of the Bench Press Reps they perform during the current Set by selecting “PP – Peak Power” from the drop-down and entering “60”. The Advanced Set Editor gives coaches another way to prescribe targets. If the coach wants to prescribe a precise value, they begin by selecting the Target Measurement (Average Velocity, Peak Velocity, Average Power, or Peak Power). 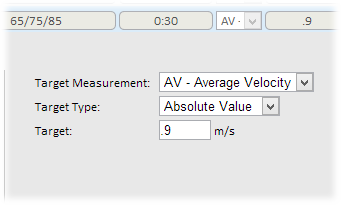 Next, they select a Target Type of “Absolute Value” and enter the velocity (e.g., 0.8) or power in watts (e.g., 900). If the coach wants to prescribe a percentage of power or velocity compared to other Reps from that Workout Session, they choose the appropriate Target Measurement, select a Target Type of “Relative Percent” and enter the percentage the Athlete should achieve (e.g., 60). Additionally, the Exercises Team Setup page is updated to enable coaches to set the default Target (Average Velocity, Peak Velocity, Average Power, or Peak Power) for each Exercise. When a default is set, the Target will be automatically set when the Exercise is added to a Workout Design. Body Compositions – Athlete information is expanded so coaches can track body composition data. At any time, coaches can enter skinfold measurements that are then recorded for historical reference over the career of the Athlete. Results are compared to the most recent measurements to show changes in body weight, body fat percentage, amount of lean mass, and amount of fat mass. 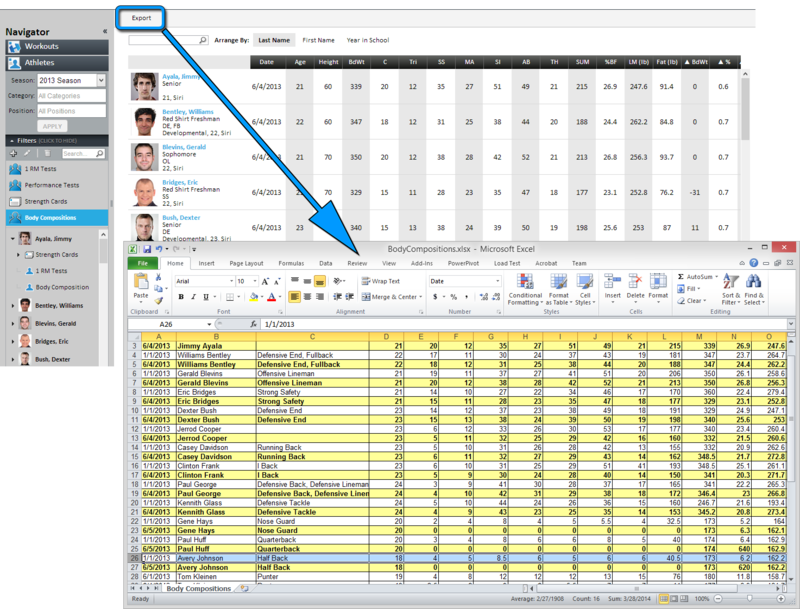 StrengthPlanner is flexible enough to enable coaches to record and track seven common skinfold measurement Values (Chest, Tricep, Subscapular, Midaxillary, Suprailiac, Abdominal, and Thigh) or three common Results amounts (percent of body fat, amount of lean mass, and amount of fat mass) by toggling the Values or Results buttons. The Chest, Tricep, Subscapular, Midaxillary, Suprailiac, Abdominal, and Thigh Values entered for an Athlete. The percent of body fat, amount of lean mass, and amount of fat mass Results entered for an Athlete. Male and female variants of these methods can be selected, enabling StrengthPlanner to make the necessary calculations due to the differing body densities of males and females. 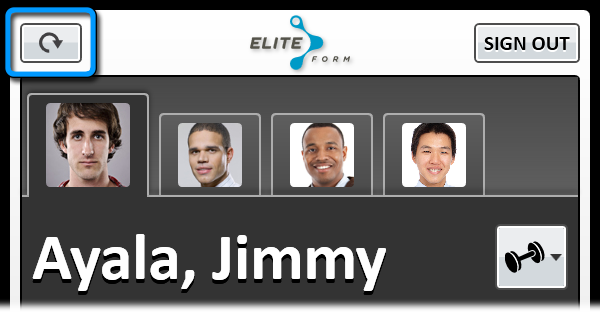 Coaches can also view their team’s body composition data and export it to Microsoft Excel spreadsheets. Rest Timer Updated – The Rest field is no longer a drop-down and now allows coaches to enter any number of minutes or seconds an Athlete should rest between Sets. 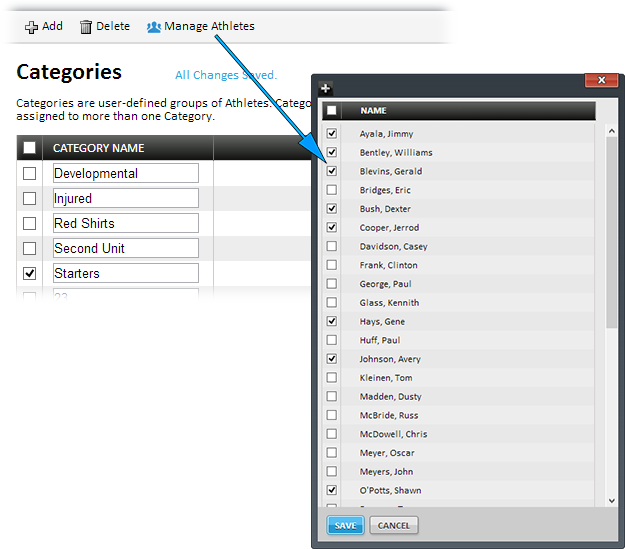 Improved Athlete/Category Management – Managing Athletes within Categories in StrengthPlanner is now faster and easier. 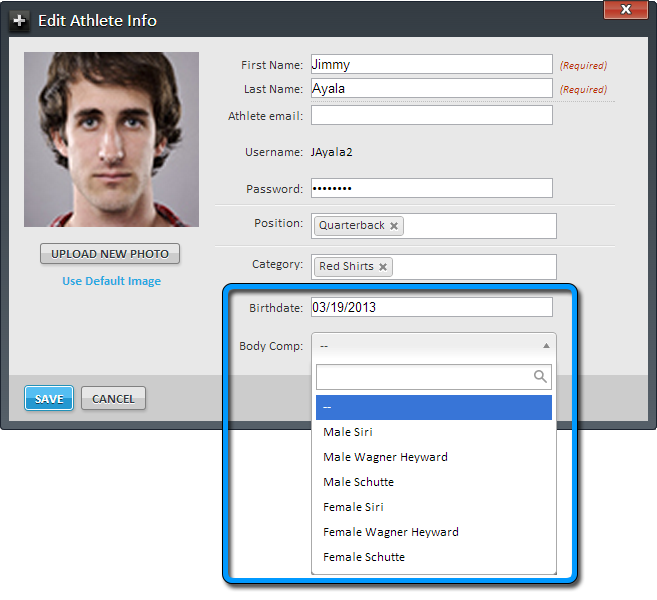 When a Category is selected, coaches can click the new Manage Athletes button to open a list of Athletes that can be added to or removed from the Category. Refresh Button – PowerTrackers are updated with a new refresh button. When this button is tapped, the PowerTracker unit is updated with the most recent information from EliteForm Paperless, StrengthPlanner, and other PowerTrackers – including added and removed Athletes and Teams – so you can be sure you have the latest workout information. Trap Bar Jump Shrug Tracked – The Trap Bar Jump Shrug can now be tracked by PowerTrackers. 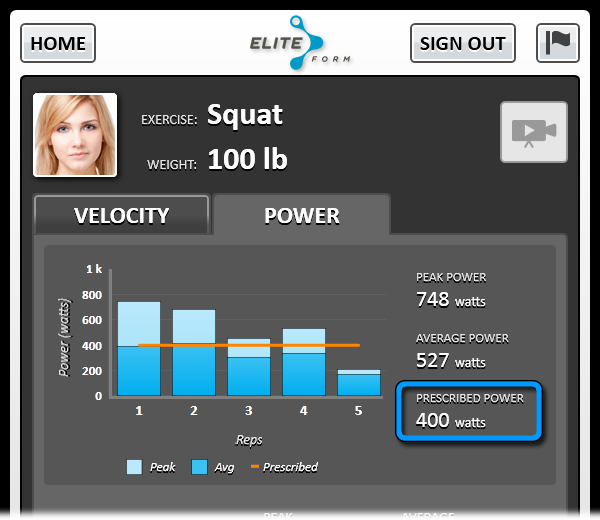 Prescribed Power Included – PowerTrackers now show Athletes the power prescribed in the Workout Design. A line on the chart indicates where the prescribed power falls in relationship to the actual power exerted during each Rep.